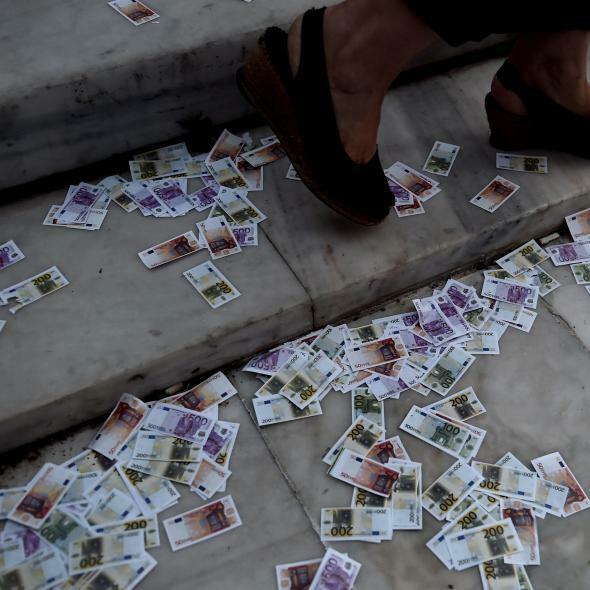 Fake euro currency are thrown on the ground during a pro-European demonstration in front of the Greek parliament in Athens on June 22, 2015. Mr. Tsipras said he was calling the referendum because Greece’s creditors — the I.M.F., the European Central Bank and the eurozone countries — had refused to negotiate in good faith and present a fair compromise. “The goal of some of Greece’s partners is the humiliation of an entire nation,” he added. Now much will depend on whether the European Central Bank will accept to continue to prop up Greek banks even after the country’s bailout program expires. It would be under huge pressure to stop using eurozone taxpayer money to keep alive the banks if there is no prospect for a deal. In that case, the banks would likely collapse and the Greek government would have to support them itself. Penniless, the government would have to revert to printing a new currency, effectively drawing the country out of the euro union. Two senior Greek retail bank executives said as many as 500 of the country’s more than 7,000 ATMs had run out of cash as of Saturday morning, and that some lenders may not be able to open on Monday unless there was an emergency liquidity injection from the Bank of Greece. An official with Greece’s Capital Markets Commission, the markets’ regulator, also warned that the Athens Stock Exchange may be unable to operate on Monday without a cash injection into the banking system. A Greek central bank spokesman said it was making efforts to supply money. Tsipras, whose leftist Syriza party came to power in January by promising to end painful austerity measures and keep the country on the euro without savaging public spending, now appears to be playing a game of chicken with Greece’s creditors. German Chancellor Angela Merkel, a key player in the Greek debt negotiations, described the terms of the final offer extended to Athens yesterday as “extraordinarily generous,” but letting Greece go bankrupt could force it out of the eurozone, dealing a blow to the euro project and the notion of European integration in general—not to mention the effects it would have on global financial markets. Five years ago was a good time for a risky bet. Today, Greece has no cards, and their best bet would have been to surrender months ago and hope to quietly score some small concessions down the road after building some good will. Tsipras couldn’t very well sweep to power promising to tear up the old deal and then agree to basically the same old deal. He had to make a great months-long show of trying for something better, even though it’s always been impossible for him to get something better. Syriza’s performance in the last five months, culminating in Tsipras’s surprise move, clearly shows Greece misfired when the party was elected in January. The referendum, if it is actually held, gives Greeks another chance. If they refuse to back Syriza in it, there will probably be an early election. Whomever it empowers will need to start from scratch with the creditors: They will still want to do some kind of deal rather than have Greece walk away from all its debts. It’s OK to move the deadline again: The Greek people deserve a chance to get it right.